Practice: UK Patent Office changes its Name, Logo and Website. Again! What we had called the Patent Office for over 150 years has just got a new website, a new logo and even a new name. My first impression was that the new logo (sorry “device mark” if It has been registered) looked like the flag of Barbados (see below). "Inspired" by the flag as one of my clients who was defending a passing off case once said. But having compared the two close by I think that the logo is an extraordinarily honest piece of work. The little blobs must be pound coins and the bigger blobs £2 coins representing money going down the plughole. 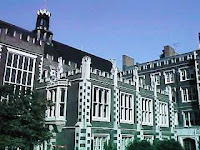 I have just returned from the first two sessions of the Bar Council's Access to the Bar Day at Inner Temple. When I reviewd the new Patent Court Guide on 6 NovI pointed out that it did not have a specimen order. That has now been corrected and the complete guide appears in its full glory at http://www.hmcourts-service.gov.uk/cms/files/Patents_Court_Guide_as_revised_on_18_November_2008.pdf. However, the old one is still on the Courts Service website. So beware. Colin Birss QC is giving a talk for the AIPPI at Allen & Overy on Symbian entitled "Symbian: Where do we stand now?" on 4 Dec. It should be good. I have heard Colin speak before. The cost is only £20 and if I can find time to get to London I shall be there. For those who can't make that event, NIPC Training is also discussing Symbian and linking it with Bilski at Liverpool on 5 Feb 2009 (see "Software Protection after Symbian and Bilski" on www.nipc-training.co.uk. I shall be speaking as will Robin Bartle of WP Thompson. Kirwans have also promised a speaker and we have invited contributions from the IP Office, Intellect and the NCC. You can register an interest by completing the on-line form. Symbian is a very important case. You can read my post on the case below. Former Soviet spaceman, Col. Akexander Volkov, and the head of ballistics for the Soviet space programme, Dr. Alexander Martynov, will be at the WOW Academy in Bradford between 12:00 and 15:00 on 11 Dec 2008. Someone called "Planet" contributed a comment to my blog in Mandarin. I have not yet got round to learning that language (a project for retirement perhaps) but I ran it through Google translate and it came out as "Evidence of Limitations". The comment occurred in a request for contributions to a re-launched Northern Intellectual Property Review. Possibly the author was offering a contribution on whatever limitation period exists in the jurisdiction in which he or she had in mind. Something to do with the limitation period expiring before the application had proceeded to grant as in Lucas v CAV Ltd. 1 WLR 462 perhaps? Alternatively, he or she was making a gratuitous observation about some other feature of the blog. Between 1997 and 2001 we published a number of newsletters which won a lot of praise. They even earned me and my tenants a few free lunches with the likes of Hobson Audley (now Faegre & Benson), Wragge & Co and Allen & Overy. We played around with several titles but the one that stuck was the Northern Intellectual Property Review. That reflected the focus on IP, technology, media and entertainment issues affecting mainly small businesses outside London. Although it was successful professionally it was a disaster financially and I had to abandon it when we merged with Kingsgate. Since then Web 2.0 publishing technology has been developed which reduces considerably the cost of low volume print runs and of course many subscribers will now accept publications over the Internet in pdf format. I have done some more research and costings and believe that with the help of other IP practitioners I can revive the journal. I am therefore looking for material to publish. Possibly the most important intellectual property decision of this year from the point of view of British business will be the Court of Appeal's decision in Symbian Ltd v Comptroller General of Patents  EWCA Civ 1066 (8 Oct 2008). In that judgment the CA affirmed Mr. Justice Patten's decision to allow an appeal from the hearing officer, Mrs. Chalmers, who had upheld the examiner's objection that an application for a patent for "a method of accessing data in a computing device and, in particular to a method of accessing data held in a dynamic link library in the computing device. The present invention also relates to a computing device controlled by the method" was excluded from patentability by s.1 (2) of the Patents Act 1977 on the ground that it related to a computer program "as such" (see Symbian Ltd. 30 July 2007). One of the many innovations of the Companies Act 2006 is a right under s.69 to object to the incorporation of a company in a name that is:(a) the same as a name associated with the person raising the objection in which the objector has goodwill; or (b) so similar to such a name that its use in the United Kingdom would be likely to mislead by suggesting a connection between the company and the objector. Examples of cases where those circumstances occurred include Glaxo Plc v. Glaxowellcome Limited  FSR 388 and Direct Line Group Limited v. Direct Line Estate Agency  FSR 374. In Glaxo, for instance,. the defendants incorporated Glaxowellcome shortly after a merger between Glaxo and the Wellcome group had been announced in the hope of extracting a ransom for the name from the new holding company. USA: What will Obama do for IP? My professional body is running a full day event at the Inner Templein the Smoke known asAccess to the Bar Day (”“A2B")on 27 Nov 2008 to provide up-to-date information about instructing the Bar directly. This event is open to everyone. If you are an inventor, designer, angel, musician, business owner or any other kind of creative, enterprising or innovative individual who is fed up with paying good money for mediocre legal services this event is for you. I have just had an email from Richard Miller QC to say that a new Patents Court Guide (dated September 2008) has appeared on HM Courts Service website though the November 2003 guide remains for the time being on another part of the HMCS site. Possibly the reason for keeping the old one is that it contains specimen directions whereas the new one does not. Patents: Corus UK Ltd. v Qual-Chem Ltd.